Leather Journals with 3 Gemstone is Hand tooled leather blank journal has 3 Gemstone stones with gorgeous embossing all over the genuine leather cove with two brass latches. 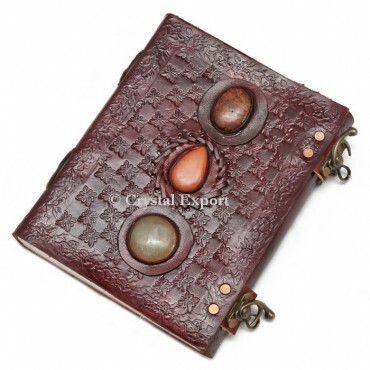 Decorated with embossing and a whip-stitched edges, it has a fantastic mystical appearance.Uniquely structured and carefully assembled. This Leather journal is produced using high caliber costly leather; it is stylish, Cool and upset looking.It has perfect size of 5 by 7 and easy to carry in your bag.It has Numbers of plain sheets plenty to write down any notes, every day plans, unpleasant sketch or thoughts for your book, novel or projectile diary. Order Online at Crystal Export.